The fully equipped geologist most time was considered a reason for distrust by native people. If he was dressed poorly or returned from field work covered with dirt or dust, it could happen that he got arrested and denounced for vagabondage. When he appeared to dressy, causing the impression that he got a lot of money, there was the danger to become a victim of robbery or even murder. Also in many regions (especially in the east border regions) of the Austro-Hungarian Empire there were political aversions against people coming from the capital of the monarchy. The pants should be comfortable and wide, cut from a light fabric. Underwear was considered an unnecessary luxury. The jacket should possess a lot of pockets, to carry in a comfortable way the collected mineral and fossil specimens. Cotton shirts were popular. Tie or a fly were considered essential parts of the outfit. 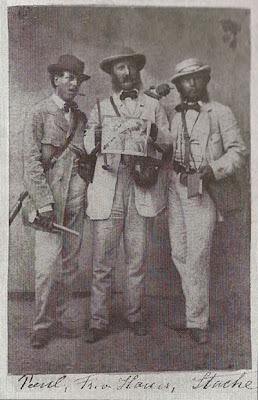 Geologists working in the field had to use two kinds of hats: a gray or black felt hat with a wide rim, and a cylinder, when there was the necessity to enter a tavern. Fig.1. Carl Maria Paul, Franz von Hauer and Guido Stache, fully equipped for field work (ca. 1860, picture taken from GSTÖTTNER 1999). So dressed and fully equipped, it does no wonder that geologist during their long and solitary field trips were considered sometimes a little bit introverted. 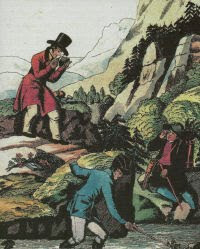 In his story “La vallèe de Trient” the Swiss author Rodolphe Toepffer (1799-1846) wrote: "Geologists are very pleasant companions, especially for geologists. It’s their art, to stop at every stone, and carry out an investigation at every layer of earth! […] And that’s why I love this science so much. It is infinite and boundless as all poetry!" GSTÖTTNER, M. (1999): Ausrüstung und Leben der frühen Geologen im Gelände. In: Geologische Bundesanstalt (ed. ), Die Geologische Bundesanstalt in Wien - 150 Jahre Geologie im Dienste Österreichs (1849-1999). Böhlau Verlag. Wien.